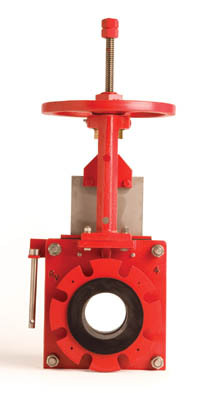 Standard gate material – 316 S.S.
Red Valve’s Series DX Slurry Knife Gate Valve is recognized as the most durable and user friendly knife valve designed for difficult slurry applications. When the valve opens, the Series DX reinforced elastomer sleeves seal against each other and provide a 100% full port opening, which minimizes turbulence, which in turn eliminates wear. The seats isolate and protect all metal parts of the valve from coming in contact with the process. When the valve is closed, the sleeves provide a drop tight seal. Another unique feature to this valve is its ability to provide drop tight shut-off in both directions. Each time the valve strokes, the Series DX Valve is designed to discharge a small amount of slurry out of the valve, which keeps the gate path and seat area clear of entrapped particulates. Unlike traditional knife gate valves, the DX prevents slurry build-up in the seat area, which might otherwise prohibit the valves ability to close. A wiper blade mounted to the top of the valve eliminates process from leaking out of the top. The wiper blade also prevents external grit and debris from entering the valve body. An optional secondary packing gland is available for high cycle rate appliactions, which eliminates leakage through the top 100%! Both the slurry sleeves and gate are field replaceable. Extensive in-house testing and and proprietary formulation of elastomers allows us to guarantee our sleeves against fatigue or loss of compression and memory for 250,000 cycles! To address concerns with slurry discharging from the slot in the valve, a plate style splash guard is utilized. Optional systems are available to pipe or flush the slurry away.